The Postage Due stamps of Sweden were first issued in 1874, with additional printings through 1886. These Postage Due stamps are all inscribed "LÖSEN", meaning "redemption" or "stamp fee" in this context. The balance of the design features a large denomination numeral in a circle and the denomination spelled-out in the tablet below. 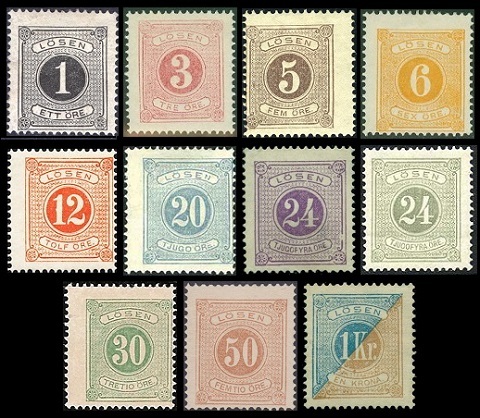 The eleven major-type Postage Due stamps of Sweden shown above were issued between 1874 and 1886. They are typographed on unwatermarked paper. Their other attributes will be described in the tables below. The catalog attributes, for Postage Due stamps that are perforated 14, are as follows. 01 Ö. (1874 - Sc. #J1) - Black. 03 Ö. (1874 - Sc. #J2) - Rose. 05 Ö. (1874 - Sc. #J3) - Brown. 06 Ö. (1874 - Sc. #J4) - Yellow. 12 Ö. (1874 - Sc. #J5) - Pale Red. 20 Ö. (1874 - Sc. #J6) - Blue. 24 Ö. (1874 - Sc. #J7) - Violet. 24 Ö. (1874 - Sc. #J8) - Gray. 30 Ö. (1874 - Sc. #J9) - Dark Green. 50 Ö. (1874 - Sc. #J10) - Brown. 01 K. (1874 - Sc. #J11) - Blue & Bister. The catalog attributes, for Postage Due stamps that are perforated 13, are as follows. 01 Ö. (1880 - Sc. #J12) - Black. 03 Ö. (1877 - Sc. #J13) - Rose. 05 Ö. (1877 - Sc. #J14) - Brown. 06 Ö. (1877 - Sc. #J15) - Yellow. 12 Ö. (1877 - Sc. #J16) - Pale Red. 20 Ö. (1878 - Sc. #J17) - Pale Blue. 24 Ö. (1884 - Sc. #J18a) - Violet. 24 Ö. (1886 - Sc. #J18) - Red Lilac. 24 Ö. (1882 - Sc. #J19) - Gray Lilac. 30 Ö. (1877 - Sc. #J20) - Yellow Green. 50 Ö. (1877 - Sc. #J21) - Yellow Brown. 01 K. (1877 - Sc. #J22) - Blue & Bister. The Swedish word "Oinlöst" means "not cashed" or "not paid" in this context. The general practice for handling short-paid letters, during this period, was for the receiving post office to add an un-canceled Postage Due stamp (or stamps) to the letter. If the letter was claimed by the addressee, and the amount of postage due was paid, the Postage Due stamp was canceled with a normal circular date stamp. If the letter was not claimed by the addressee, and the postage due was not paid, then the letter was retained by the postal administration, and the Postage Due stamp was canceled with the boxed "OINLÖST" marking. The majority of used stamps with this cancel seem to be from the 1874 (perforated 14) issues. The marking is relatively common on off-cover stamps, but only a couple complete covers with the marking are presently known.